The Anglican-Orthodox Theological Dialogue held its first plenary meet-ing at Oxford in 1973, and since then it has produced three agreed statements: The Moscow Agreed Statement (1976), The Dublin Agreed Statement (1984), and The Cyprus Agreed Statement (2006). The last of these, entitled The Church of the Triune God' (113 pages), dealt in detail with the doctrine of the Church, and in particular with the nature of primacy in relation to episcopal collegiality, and with the different ministries of men and women in ecclesiastical life. All of these three agreed statements have been published in book form and have been distributed to the general public. From 2007 onwards the Anglican-Orthodox Dialogue has entered a new phase. With the unanimous agreement of both sides, the topic for discussion has moved from the realm of ecclesiology to that of anthropology. We have been considering the nature of the human person, with particular reference to the creation of humankind according to the image and likeness of God. A report on the theological presuppositions of the doctrine of personhood, running to about 10,000 words, has been prepared by the Commission, and it is hoped that, after further revision, this can be endorsed by the next plenary session of the Commission to be held at Buffalo, NY (USA) on 19-25 September 2015. (1) Human responsibility for the environment; our efforts to overcome the current ecological crisis. (2) The views held in our two Churches concerning human sexuality, gen-der distinctions and marriage. (3) Our respective practices in regard more especially to birth control, abo-rtion, embryology and research into the foetus. (4) Our respective attitudes towards euthanasia and assisted dying. These issues are in many ways highly delicate and controversial, and they will need to be handled with sensitivity and discretion. They also raise questions of a complex technical character, and so the Commission will as appropriate invite experts to our meetings, to ensure an informed discussion. It is our practice to hold a week-long plenary session of the Commission during the course of every year. 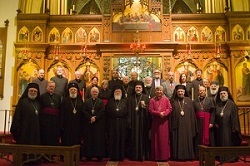 Each of the fourteen Orthodox Patriarchates and Autocephalous Churches is entitled to send one delegate, and the Anglicans on their side appoint a corresponding number of fourteen delegates. Allowing for absentees, this means that our meetings are attended by approximately twenty persons. We also have an Executive Committee and a Drafting Committee, which meet as required. At the last plenary session of the Commission (Jerusalem, 17-24 September 2014), the following Orthodox Churches were represented: the Ecumenical Patriarchate, Alexandria, Antioch, Jerusalem, Serbia, Romania, Cyprus. Delegaies from the Churches of Georgia, Greece, Poland, Albania, and the Czech Lands/Slovakia were unable to attend. The Church of Bulgaria does not participate in the work of the Commission. The general spirit of our meetings is warm and friendly. A number of Anglicans on the Commission are close in their theological outlook to the Orthodox, but there are others - of the Evangelical and Liberal wings of Anglicanism — whose viewpoint differs markedly from that of the Orthodox Church. Because of the many discordant opinions existing within Anglicanism, it would be unrealistic to imagine that there can be organic union and a restoration of eucharistic communion between our Churches in the foreseeable future. Yet we are nonetheless making slow but steady progress in mutual understanding. For this reason it is my firm opinion that the Orthodox-Anglican dialogue is yielding positive results and should be continued.